My grandmother has lived in her house since the mid 1950's - a modest Cape Cod in a neighborhood with rows and rows of similar houses. My grandmother made hers unique with the landscaping. Her garden and lawns are still always lush and beautiful while the rest of the neighborhood has slowly fallen apart. There is a pine tree on the side of the house where squirrels and birds fight for nesting space. It's hard to walk on the grass because of the sharp needles. I have an old photo from when I was five - I'm standing with my uncle next to that tree, which is only about 5' tall at the time. Now the tree towers over the neighborhood, taller than the telephone wires. showing its age. That tree shades the patio for part of the day as the sun moves across the sky. Just outside the cyclone fence are rows of rocks that were brought down from somewhere up north in Michigan. My grandmother doesn't remember exactly where but my grandpa created a rock garden that has remained along that fence ever since I can remember. Over the years the landscaping in the yard has changed, trees have grown, bushes have flourished, patio furniture has come and gone, but the only difference in the little rock garden is where the weeds grow. This year a lovely little patch of greenery creeps over the rocks as if to claim them as its own. Pine needles drop from that tall tree and tiny ants make their homes in the dirt. 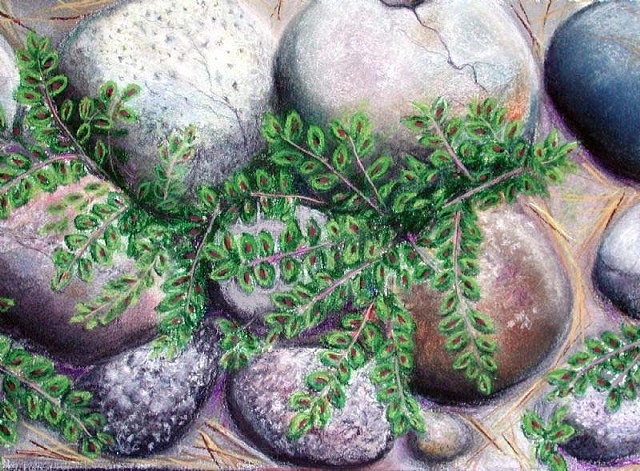 I spent five hours drawing this patch of rocks and greenery. The sun was behind clouds for most of this day and even while it was out, the pine tree cast it's shadow over the rocks. I finished just as the last little bit of sun that peeked out from the clouds was settling in for the night. This piece was done on Strathmore Drawing Paper using Windsor Newton soft pastels and colored pencils.